For the better part of the Seventies, Sherbet were the Kings of Pop in Australia. By mid-decade they were undisputed rulers of the Australian charts and stages, and only with the appearance of the mighty Skyhooks was Sherbet confronted with its first serious rival. Astutely managed by Roger Davies, vigorously marketed as a teen-oriented singles band, they produced polished, highly commerical pop/R&B. In terms of teen adulation (especially with girls), they were the true successors to The Easybeats, with lead singer Daryl Braithwaite unquestionably the most popular male performer of the period. Their popularity reached Beatle-esque heights, with regular riots, mobbings and scenes of crowd hysteria. Although sometimes criticised (at the time) as lightweight, they were a classic pop band whose success was solidly founded on great musical ablility and sheer hard work, not just marketing hype. Sherbet remains one of the best-selling and most successful bands in Australian music. They produced some great original material and enjoyed a record-breaking string of hits, with an amazing run of sixteen consecutive Top 40 singles between 1971 and 1977. They also hold the unique honour of being our first band to score an overseas hit with a song written, recorded and produced entirely in Australia -- "Howzat". Clive Shakespeare formed Sherbet in early 1969 with members drawn from three Sydney bands: Sam See from Clapham Junction, Laughlin from Sebastian Hardie Blues Band (the earlier blues/R&B incarnation of Mario Millo's progressive outfit Sebastian Hardie) and Shakespeare, Rae and Taylor from soul/funk outfit Downtown Roll Band, one of a number of Sydney bands who were performing Motown, Stax and James Brown material. Sherbet's first live performance was at the New 2UW Spectacular held at Brookvale Oval in Sydney on 19 March 1969, and their first mention in the music press was in Go-Set's coverage of the event. The lineup then changed almost immediately, with Rae replaced by Bruce Worrall, previously a member of Bright Lights, House of Bricks and Samael Lilith. Danny Taylor left in July 1969, replaced by young drummer Alan Sandow, whose previous band, Daisy Roots, had broken up after one of its members was called up for National Service: "A promoter linked me up with the other guys and I ended up moving into a five-storey house in Surry Hills, Sydney, with them," he says. "I was 17." 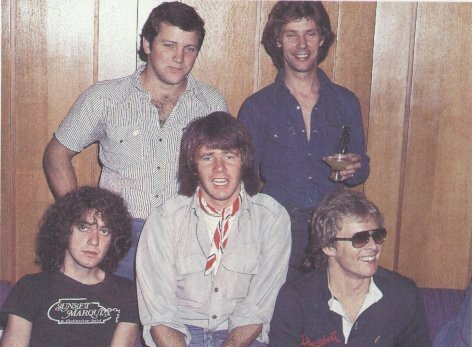 (Sunday Telegraph) Daryl Braithwaite, who had already worked with Worrall in House of Bricks and Samael Lilith, joined late in 1969, and for a brief period, the band had two lead singers before Laughlin left in early 1970. Early in the new year they began a gruelling but crucial 8-month residency at Jonathan's disco in Sydney (located in the old Phoenician Club building, which still stands on Broadway, in the inner city suburb of Ultimo). Playing seven hours a night, four nights a week quickly welded Sherbet into a formidable live act. Just how good they were in those early days has been preserved for posterity -- a very early live recording made during the Johnathan's period (possibly just before Laughlin left) was included on the bonus disc of the 30th Anniversary compilation. It's a killer version of the Jackson Five track "The Love You Make" with Daryl providing some remarkable falsetto for the Michael Jackson parts. Even at this early stage it was evident that they were one of the tightest, most accomplished and most versatile outfits on the local scene. The band's early influences were from pop/progressive bands like the Small Faces and Traffic, as well as from American soul and R&B, as the Jackson cover suggests. Between 1971 and 1978, Sherbet released 15 albums and 30 singles. Among these were Australian pop classics such as "You've Got The Gun", "Child's Play", "Slipstream", "Cassandra", "Life", and "Summer Love". Their earlier singles and albums were produced by Festival house producer Richard Batchens, but in 1975, with Batchens increasingly concentrating on Richard Clapton, Sherbet's production was taken on by Richard Lush, the former Abbey Rd alumnus and engineer on many of the The Beatles' later recordings, including the Sgt Pepper's LP. Braithwaite also branched out with a solo career, releasing several singles under his own name -- "Old Sid", "Love Has No Pride", "Afterglow" (a cover of the Small Faces classic) and his solo No.1 hit versioj of the Cilla Black hit "You're My World". In early 1973, Daryl won the lead role in the famous Melbourne concert production of the Who's Tommy, which was staged at the Myer Music Bowl and televised nationally. Daryl's popularity soared during the mid-70s, as did Sherbet's; he was crowned TV Week King Of Pop three years running (1975-1977), with Sherbet named Best Australian Group for five years in a row, 1973-1978. Daryl's solo outings fuelled constant press speculation that he would leave the band and go solo, but according to the group, that was never in doubt -- it was all hype. In concert, Sherbet were outstanding. As their live recordings attest, they were tight, disciplined, consistent and highly professional. They were also one of the hardest working bands in the business. They kept up a punishing touring schedule throughout their career and visited almost every part of the country at one time or another, completing around 20 national tours. In an industry well-known for tantrums and "no shows", Sherbet missed only one gig in fifteen years of touring, according to Sandow! Sherbet was also the first Australian band to be able to maintain a large-scale, permanent touring operation which included "specially-designed stage clothes, 3 1/2 tonnes of stage equipment, a 2000-watt amplifcation system, and an integrated light show which included ... pyrotechnic effects." (Conn, 1996, p.28). "I couldn't even go out the front of my house because there all these girls just hanging on the fence ... There was always a deadline for Garth and me - another album, another tour. When it did finally end, I was relieved more than anything because I had had enough. I left the band early in 1976 for reasons I don't want to discuss fully ..., but let's just say I wasn't happy about where all the money went." Shakespeare set up and and ran a successful Sydney studio, where Paul Kelly's 1984 classic solo album Post was recorded. Gunther Gorman filled in briefly on guitar, but Sherbet proved their resilience, recruiting respected lead guiatrist Harvey James (formerly with Ariel and Mississippi). The massive success of the Howzat album fully vindicated the band. With the Howzat single they finally also achieved the coveted national No.1 spot in 1976, and when the song became an international hit, they seemed certain to repeat their Australian success overseas. Ultimately, overseas success failed to materialise, despite the band's determination and strenuous efforts. In retrospect, several factors combined to defeat them. Their 'pop' image, was certainly a factor in denying them lasting popularity, broader appeal and overseas recognition, especially in the late 70s when punk and new wave became a major force of musical fashion. Although Sherbet's earlier material could perhaps be criticised as being a bit lightweight, they did not lack the depth that was needed for to make the transition into the 'adult rock' market, and in fact Garth and others are adamant that their later material -- which was largely ignored -- was some of their very best, and as good as anything else around at the time. Crucially though, they suffered the same fate as so many bands before them -- they were denied the record company support that was vital to breaking them into an overseas market, and the local media began suffereing from "tall poppy sydnrome" and mounted increasingly harsh attacks on the band in the late '70s and early '80s. Sherbet's decline really began during their ill-fated US tour in 1978. Although they were a fine band with plenty of potential and a huge following in Australia, they were virtually unknown in the US, which meant starting from scratch. The problems were soon compounded when a major dispute flared up with their American label, MCA. Soon after their arrival, they split with the label and were left virtually stranded. Fortunately they found an ally in Andy Gibb (then enjoying major success in the US) - he recommended them to his label, the Robert Stigwood Organisation, who signed them up. RSO, however, felt the name Sherbet didn't have the 'adult' image that was needed to promote them in the States, so the name was changed to Highway in 1979. The American venture proved a failure, and band split later that year. Braithwaite and manager Roger Davies returned to America where Daryl recorded a solo album, Out On The Fringe. Somtime during this period Davies and Braithwaite parted ways, with Davies taking up an offer of managing Tina Turner; she was then just beginning her career comeback, and in the following years Davies used his considerable skills and experience to guide Tina back to a huge career comeback in the 1980s. Sherbet regrouped in 1980 as Sherbs and released the studio Albums I Have The Skill and Defying Gravity, and a mini-album, Shaping Up. It was galling for the group that towards the end they produced what they and many other felt was some of the best music of their career, but their efforts fell on deaf ears with the industry. They soldiered on until 1984, but waning public interest, poor sales, and lack of support from the record company meant the writing was on the wall. It's also interesting to consider how they might have fared if Davies had stayed on as manager. Ironically, their farewell tour as Sherbet was wildly successful, culminating in a rousing final show in Queensland's Great Keppel Island resort. Post-Sherbet, Garth Porter and Clive Shakespeare both moved into production, and Braithwaite spent several years away from the music scene. In 1986 he formed a short lived band Missing In Action with his twin brother Glenn, and then worked for some time in Melbourne as part of the duo OLI with pianist Dale Krause. Encouraged by the huge success of John Farnham, Daryl launched a successful solo career comeback in 1989 and enjoyed considerable succes with his album The Edge. Although his comeback suffered a major setback due to his highly publicised management and financial problems, Daryl is still going strong and singing as well, if not better, than in Sherbet's heyday. Garth Porter is now established in Tamworth as a leading producer of country music. Together Again ... for the first time! After 14 years apart, Sherbet (minus drummer Alan Sandow, who wasn't available) reunited on New Year's Eve, 31 December 1998, for an ABC-TV special, hosted by satirist and Sherbet superfan Elle McFeast (Libby Gorr). Sherbet opened the show, performing an brilliant live version of Howzat and closed with a equally rousing rendition of "Summer Love", with help from old mates including John Paul Young. The special showed they they had lost none of the skills that kept them at the top for so long. The event was doubly historic, being the first and only time that guitarists Clive Shakespeare and Harvey James played together in the group. They were interviewed by Elle and maintained their dignity and good humour throughout, despite being subjected to some rather cringe-inducing period footage from a mid-70s Countdown special on the band. Left: the Sherbet stamp, from Australia Post's 1998 "Australian Rock & Roll" series. 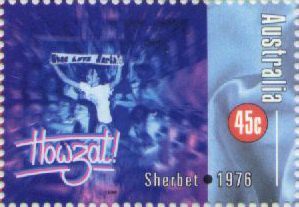 Also in 1998, Sherbet was honoured with its own stamp, commemorating their 1976 international success with Howzat. The Sherbet revival continued apace in 1999; the band celebrated the 30th annniversary of its formation in August when Australian cable network Foxtel screened a new, one-hour documentary about the band Howzat: 30 Years of Sherbet, coinciding with a remastered Sherbet 2-CD set of the same name, compiled by Festival's Warren Fahey. Despite public statements that each occurrence would be definitely the last and only time they would get back together, Sherbet has reunited on several other occasions. The first was a labour of love, as the headliners of the second night of the historic "Gimme Ted" benefit concerts in Sydney in 2002, and more recently they reformed for the "Countdown Spectacular" nostalgia tour.